A stunning, sizable town on the southwest coast of Florida, Cape Coral has its fair share of claims to fame. As a master-planned, pre-platted community started in the late 1950s, Cape Coral was touted by several celebrities and promoted more than most other Florida developments. After it grew to be the eleventh largest city in Florida, Cape Coral retained its renown by being declared a “Waterfront Wonderland” due to the fact that it has more miles of canals than any other city in the world. This picturesque city lining the brim of the Caloosahatchee River is now thriving, but that does not mean that Cape Coral is without its struggles. The residences and businesses of Cape Coral can still be plagued by problems such as deteriorating seawalls and shifting foundations, but solutions to these problems are always available from Solid Foundations. Cape Coral’s four hundred plus miles of navigable waterways allow hundreds of people to enjoy luxurious living on waterfront properties, and many of those waterfront properties are protected by stout seawalls. The purpose of a seawall is to keep the water a manageable distance from the home, but sometimes, fulfilling this purpose becomes very difficult for seawalls due to the constant discouragement of abusive wind, waves, and weather. Harsh environmental elements can jeopardize the security of seawalls, and evidence that a seawall is succumbing to the pressure appears in unsightly cracks; pitted surfaces; bowing, bulging, or gaping sections; soils washing away; and growing distance between the seawall and the deck. When seawalls in Cape Coral, Florida, show these kinds of signs of wear and tear, the source of their rescue comes from Solid Foundations. Solid Foundations is here to supply efficient and effective Cape Coral seawall repair services. Calling on Solid Foundations to fix your Cape Coral seawall problems right away will save you from accumulated damage and expenses in the future and will guarantee the quality and professionalism of the work. Solid Foundations remedies seawall troubles with our Targeted Grout Injection process that inserts hydrophobic grout into the leaks and voids in and around your seawall. This grout successfully expands to form a solid, waterproof mass that fills the voids and strengthens the soils without diluting in the presence of water. The superior repair system of our Targeted Grout Injection removes the need for any digging or excavation around your seawall, and it also completely restores the safety of your seawall. So, to continue to delight in the countless canals of Cape Coral, trust Solid Foundations for your Cape Coral seawall repair. The climate of Cape Coral is described as tropical wet and dry, and this characteristic of the area features its own pros and cons. Citizens of Cape Coral certainly appreciate the 355 days of sunshine that Cape Coral experiences every year, as well as the very warm summers, but their homes and businesses may find cause for concern in the 54 inches of rain that Cape Coral also receives every year. The rain falls from May to September and is heavy but brief during the summer months, but hurricane season extends the excess water in the air and on the ground by lasting from June to November. The large amounts of water that surround and come down on Cape Coral can be bad news for the foundations of the local living and working structures. When the soil beneath a foundation become oversaturated with water, hydrostatic pressure can build on the foundation and force the foundation to endure more stress than that for which it was designed. The consequences of this extreme pressure are cracks in the foundation that can cause your foundation to shift and let water, insects, and small animals into your home. These problems are just the beginning, because the longer a home relies on a cracked or shifted foundation, the worse conditions can become for the home and the family living inside. 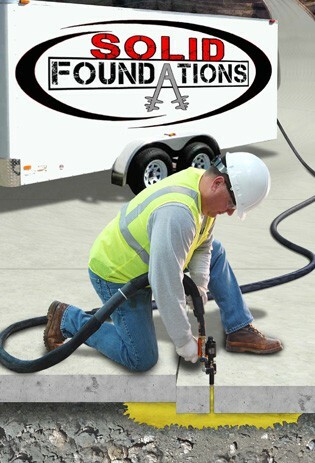 Therefore, when your Cape Coral foundation shows signs of damage such as cracks in the walls, floors, and ceilings; sticking doors and windows; leaning walls or chimneys; sloping or sagging floors; or puddles of water around your property, then you can be sure that it is time to call Solid Foundations for our Cape Coral foundation repair services. In order to supply more secure and steady foundations to the Cape Coral area, Solid Foundations utilizes dependable tools such as steel push piers, helical piers, wall anchors, cement grouting, and polyurethane resins to shift the weight of your structure onto more capable soils and get your home back on solid ground. A lifetime transferrable warranty comes with all of our Grip-Tite® piering systems, so the people of Cape Coral can love both the sun and the rain when they strengthen their foundation with Solid Foundations’ foundation repair in Cape Coral. Besides the consequences of endless waves and heavy rains that Solid Foundations’ Cape Coral seawall and foundation repair services address, we also offer fixes for sinkhole threats. The parts of Cape Coral that have not been carved out for canals rest on limestone bedrock that can easily erode under the constant flow of the acidic rainwater that regularly pours down on the city. Underground erosion creates the perfect conditions for sinkholes, so like the rest of Florida, Cape Coral lives with the possibility of sinkholes. However, Solid Foundations can eliminate this possibility with our Cape Coral sinkhole remediation services. With these services, Solid Foundations can prevent or contain sinkhole damage by using compaction grouting and void filling methods to stabilize the ground under and around your home. By filling any cavities that may have formed and gluing the soil particles together, Solid Foundations can solve any sinkhole problems in Cape Coral, and with our other services including slab lifting and stabilization, pipe and structure leak repair, and French drain installations, Solid Foundations can solve any other structural issues in Cape Coral as well. In order to receive the most competent and caring Cape Coral seawall repair, foundation repair, and sinkhole repair services, contact Solid Foundations today.